Refreshsoft Neutralizing Rinse is a concentrated neutralizing agent used in the final extraction and rinse of the extraction cleaning process for carpet and upholstery. It completes the ideal extraction cleaning with its non-resoiling formula that includes an encapsulant polymer. Laboratory tests demonstrate that Refreshsoft rinses out soil and residue, and protects against resoiling better than water alone. It stabilizes dyes, works to prevent browning and yellowing, pH neutralizes the carpet, and leaves a soft luxurious feel. 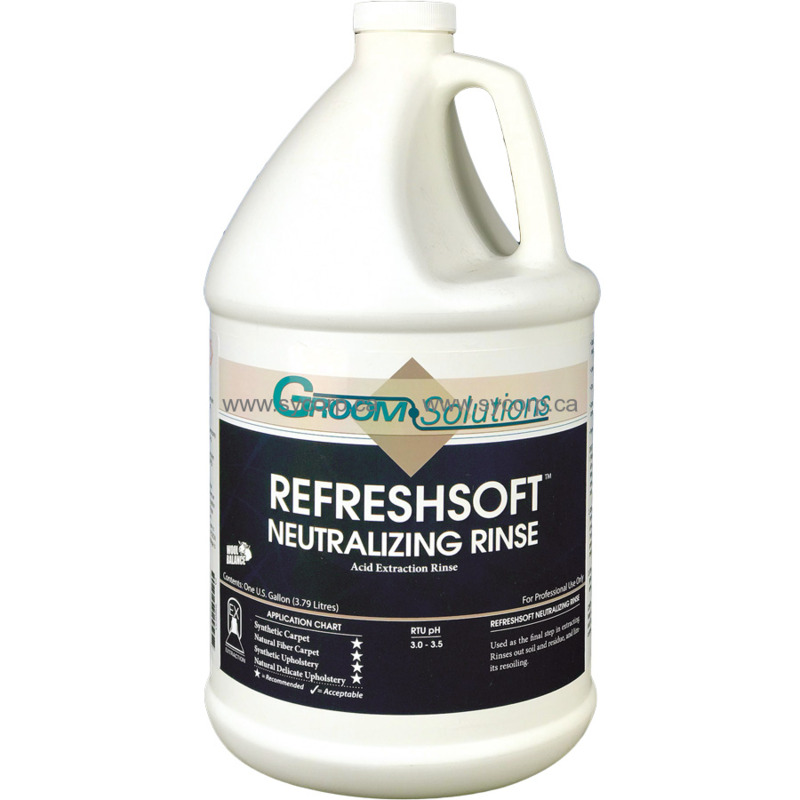 As a neutralizing extraction rinse, Refreshsoft contain special added cleaning ingredients that makes it more effective at soil removal than conventional neutralizing rinses. It is safe and effective for all synthetic fibers, including warranted stain resistant carpets, as well as all water safe natural fibers. It also contains corrosion inhibitors to protect your extraction equipment. Refreshsoft works effectively with any type of extraction equipment truck mounted, portable, or walk behind. It is especially formulated for high heat producing truck mounts that produce over 200 -220 F. You will experience superior cleaning results and will prevent re-soiling. Refreshsoft Neutralizing Rinse can be safely used on all synthetic fibers, and all wet cleanable natural fabrics. Refreshsoft Neutralizing Rinse is designed to work in conjunction with a compatible prespray. Always pretest for colorfastness in an inconspicuous area. Carpet cleaning directions: Portable extractor: Mix 2 ounces of solution to five gallons of water in extraction tank. Truck mount: Mix one quart solution (32 ounces) with five gallons of water into solution container. Set solution flow meter between 2 and 3. Upholstery cleaning: Mix 8 to 12 ounces of solution per gallon of water. It may be used as a final rinse through your extractor.